Recently I heard about a fascinating global project for students in Years 3 – 8 titled “CAN WE WORK TOGETHER TO SAVE THE ENDANGERED ANIMALS OF THE WORLD?” I love the idea of a project that enables students to collaborate with children from other countries, particularly one that strikes a chord in most kids’ hearts – endangered animals. But I know that Australian teachers are already flat-out trying to cover all the curricula and extra curricula activities with students. Do you believe the 5 C's - communication, collaboration, critical thinking, citizenship, and creativity are important in a student’s education? Do you want to transform your students learning and prepare them for life in a digitally connected world? If you answered ‘yes’, but also want to integrate and satisfy curriculum objectives, then you might be surprised to learn that you can achieve all this and more by participating in well-designed global projects! Sadly, schools in the southern hemisphere are often under-represented in projects involving schools from around the world. My thinking is that classroom teachers mostly view a global project as something that would be great to do, but it’s an extra they just don’t have time for. 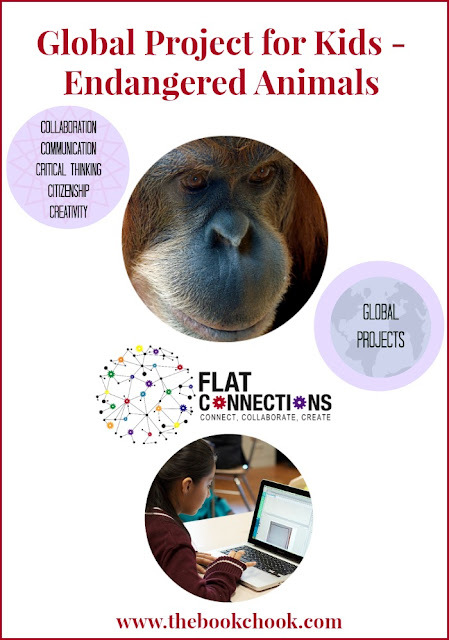 With this in mind, Julie Lindsay (Flat Connections) and I have designed a 6 week project for Years 3-8, titled: “Can we work together to save the endangered animals of the world?" I have gone through the Australian Curriculum requirements and identified all the objectives that can be met by participating in this short, free project. It will be conducted twice in 2017 to give as many teachers as possible a chance to plan its integration into their teaching and learning programs. Check out the project, the dates, the curriculum links and the application form here. Curriculum objectives that can be satisfied via this project are clearly identified in this table. When you click on the links above, I guarantee you’ll be amazed at what can be covered in one global project. This is in an exciting 21st century learning environment using web 2.0 tools that engage students. It goes without saying that Julie and I want teachers and students to succeed, so we will be there to support you in your journey! Information about other Flat Connections Global Projects can be found here. If you have any queries or concerns please don’t hesitate to make contact.